This medical malpractice claim was filed in Baltimore County after doctors perforated a man's esophagus while attempting to intubate him. It was filed in Health Claims Arbitration on January 31, 2018, and it is the 58th medical malpractice case filed in Maryland this year. A man was transported via ambulance to the emergency room at Northwest Hospital after suffering a seizure, losing consciousness, and having convulsions for 10-15 minutes in his home. The convulsions stopped after the man arrived at the hospital, and he was found to be neurologically intact. The man underwent neurology and cardiology consults and several imaging studies, lab studies, and EEG studies. Over the next four days, the man remained hospitalized and did not experience any additional seizures. Then, a nurse found the man lying on his stomach, gasping for air and non-responsive. By the time the rapid response team arrived, the man had a pulse and was breathing on his own but he was confused and agitated. His tongue was observed to be swollen with evidence of trauma. The doctors ordered medications including SoluMedrol, Benadryl, and Pepcid to be administered intravenously. The man began to seize actively, so he was additionally administered dosages of Ativan and Keppra. Because the man had a history of snoring, one of the doctors became concerned about the man's airway and decided that he should be intubated. Instead of calling an anesthesiologist to intubate the man, who was known to have a difficult airway with a tongue laceration and swelling, the doctor instructed a respiratory care practitioner (RCP) to perform the intubation. The RCP attempted the intubation three times unsuccessfully. A physician's assistant made a fourth unsuccessful attempt, unable to pass the endotracheal tube beyond the man's vocal cords. The doctor then decided to intubate the man with a King Airway in size five, the size made for people over six feet tall. The King Airway is a device that sits in the esophagus and prevents anything from passing through the throat and into the esophagus. The doctor recorded that the King Airway worked "flawlessly." Healthcare providers made a plan to transfer the man to Johns Hopkins Bayview Medical Center, but his King airway had to be removed first because Bayview was unwilling to accept patients with such a device. Once the King airway came out, the man was noted to have slurred speech and difficulty swallowing. He was not reintubated and his esophagus was not examined. A speech pathologist diagnosed him with difficulty swallowing and determined that it would not be safe for him to eat anything by mouth. Still, his esophagus was not examined. At Bayview, the man underwent a chest CT scan after a routine chest x-ray showed fluid around his lung. The CT revealed a large pocket of air and fluid near the lungs. Noting the history of difficult intubation at Northwest Hospital, the doctors at Bayview decided to perform further studies to check the man for an esophageal injury. A repeat chest CT with oral contrast demonstrated evidence of a leak from the upper esophagus. The man was taken to emergency surgery for an exploration of the neck and abdomen, left chest tube placement, and feeding conduit placement. His postoperative diagnosis was an esophageal perforation, inflammation of mid-chest tissues (mediastinitis), and severe sepsis. The man was taken back to surgery several days later for a video-assisted chest examination. The doctor converted to an open procedure after finding too many cavities in the lungs and drained a large amount of fluid, which later tested positive for infection. After finding a collection of puss in the pleural lung cavity, the doctor removed the surface layer of the left lung. He also drained and debrided the abscess from between the man's lungs. Following the procedure, the man was taken to the surgical intensive care unit where he developed hypoxic respiratory failure and acute renal insufficiency. After an additional three weeks at Bayview, the man was discharged to a rehabilitation facility. At that time, the man was continuing to fail swallowing tests, so he did not undergo an esophagram to confirm a definite recovery from his esophageal perforation. Esophageal perforation is a rare but life-threatening condition with a mortality rate greater than 20%. Patients usually develop a systemic inflammatory response soon after perforation, and the rapidly-progressing bacterial infection may cause cardiopulmonary collapse and multiple organ failure. Esophageal perforation patients are considered critically ill, so it is important for them to receive a quick diagnosis and antibiotic treatment. What are the symptoms of esophageal perforation? Patients often complain of increasing chest pain, respiratory distress, and dysphagia. Laboratory tests usually reveal a leukocytosis. Complications of mediastinitis, such as pleural effusion or pneumoperitoneum, may be evident on the chest radiograph. Time is of the essence with regards to diagnosis and therapy to prevent complications like the sepsis this patient endured. Perforations detected within the first approximately 24-72 hours often can be repaired primarily by surgical intervention or treated with a covered esophageal stent. Perforations detected in a delayed fashion frequently require an esophagectomy with end esophagostomy. So the magnitude of intervention is often directly correlated to the delay in diagnosis. Earlier detection often brings about less invasive intervention while delayed diagnosis often requires more invasive therapy. Diagnosis may be difficult because the symptoms of esophageal perforation are non-specific. But is seems based on the Complaint that esophageal perforation should have been suspected and tested for after the claimant's difficult intubation. 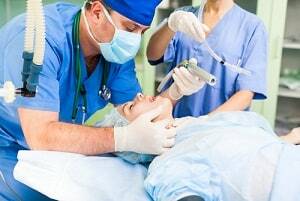 Failing to call an anesthesiologist to intubate the claimant, permitting a respiratory therapist and a physician's assistant to intubate a patient with a difficult airway instead. Improperly intubating the claimant with a size 5 King airway. Failing to take adequate precautions to avoid injuring the claimant's esophagus during intubation. Failing to adequately monitor the claimant after intubation. As a direct result of the defendant's negligence, the claimant had to undergo additional surgeries and treatment, sustained severe emotional pain and suffering, was prevented from engaging in his usual activities, and incurred financial losses. Benjamin A. Kohl, M.D., F.C.C.M., Anesthesiology and Critical Care Medicine. Dr. Kohl is board certified in anesthesiology, critical care medicine, and echocardiography. He specializes in cardiac anesthesiology. View sample settlements and verdicts from Baltimore County. Read about a perforated esophagus wrongful death claim.